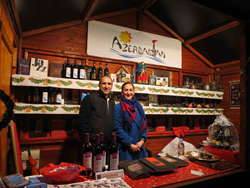 Top-quality Azerbaijani produce – alongside the country's history and culture – are being showcased at the Mulhouse Christmas market over the next six weeks. The Azerbaijani Pavilion was facilitated by the French office of The European Azerbaijan Society (TEAS), in conjunction with the Azerbaijani Ministry of Tourism and companies from Gilan Holding of Azerbaijan. Jean Rottner, Mayor of Mulhouse, opened his city’s famous Christmas market on 20 November – an important annual tradition in the Alsace region of France – which attracts many tourists from France and overseas. Braving heavy rain and wind, many people came to hear the Mayor’s opening speech, whilst sipping warming mulled wine and eating locally-produced seasonal confectionary. The city of Mulhouse, the second largest in the Alsace region, is twinned with the ancient Azerbaijani city of Yevlakh, and participation was facilitated by the French office of The European Azerbaijan Society (TEAS), in conjunction with the Azerbaijani Ministry of Tourism and companies from Gilan Holding of Azerbaijan, notably the FMCG Group and Gilan Hospitality Group, represented by Elgun Mammadov, its Deputy Director. Mr Rottner started his speech by asking the crowd to pay tribute to the victims of the recent Paris terrorist attacks. He stressed that, although France continues to grieve its dead, it is important to demonstrate that the country is maintaining its important traditions, particularly in the light of Christmas, which is a time of peace, family, and goodwill. Representatives of other cities and countries were present, including a delegation of Mayors from New Caledonia. The Mayor of Mulhouse warmly welcomed the Azerbaijani delegation, which will host the colourful Azerbaijani chalet and present their country’s produce. During six weeks, visitors will be able to enjoy Azerbaijani hospitality and taste top-quality Azerbaijani wine, paklavas, cay tea, and pomegranate juice. They will also be able to extend their knowledge of Azerbaijan and one of its most historic cities, Gabala, by reading the books and brochures available in the chalet. The Mayor thanked Ayaz Gojayev, Cultural Attaché, Azerbaijani Embassy to France, for representing the Azerbaijani Ambassador to France at this event. He acknowledged the richness and diversity of Azerbaijan, focusing on its religious tolerance. Such concepts, enshrined in the Azerbaijani constitution, are particularly important during these dark days. Soon after his speech, while touring the market, Mr Rottner stopped at the Azerbaijani stand where he was warmly received with a glass of pomegranate juice, fresh paklava, and gifts.